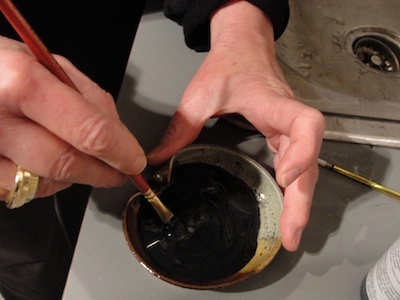 These days unexpected opportunities usually come by email but this one started with a phone call from Alan Collachicco, the Deputy Director and Curator of The House of the Seven Gables in Salem, MA. 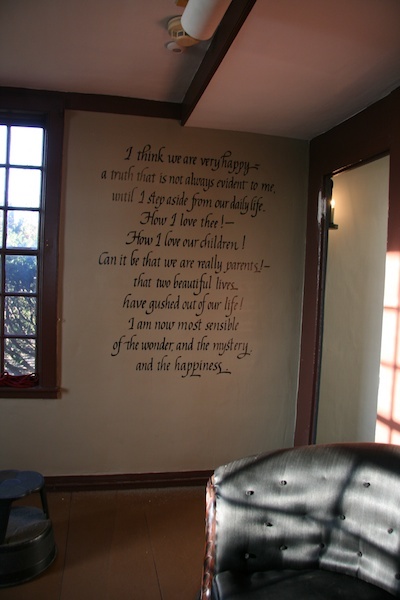 He was looking for someone to letter quotes by Nathaniel Hawthorne on the walls of writer's birthplace and had been given my name by Vicki Hendrickson, Director of Newburyport Adult and Community Education and founder and co-chair of the Newburyport Literary Festival. 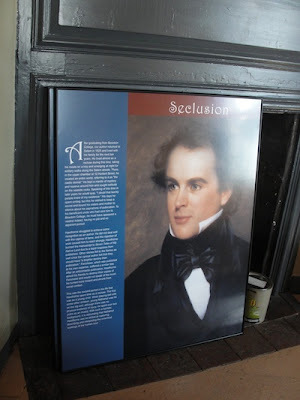 Four rooms in the house are being transformed from period rooms to galleries about the life of Hawthorne containing the desk he wrote The House of the Seven Gables, his couch, a painting by his wife Sophia, and display cases of smaller items. My task would be to write five quotes, each a sentence long. 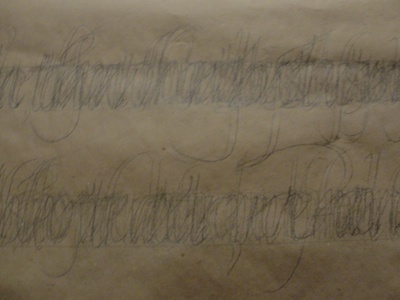 Although I hadn't done a calligraphic commission in many years, I jumped at the opportunity. 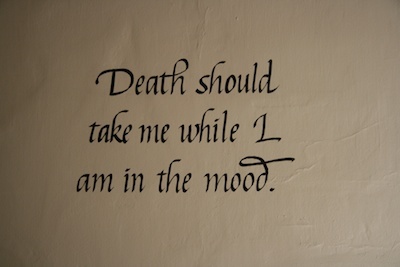 As I told Alan, I had been wanting to write on a wall for some time. The plan was to do the lettering the following week. I paid a visit to the house to see the space, meet Alan, and get the quotes which were a bit of a surprise. With his liberal use semi-colons, commas, and dashes, Hawthorne wrote some pretty long sentences. It was helpful to get a feel for the spaces and to see the walls where the quotes would go. The next step was to find the appropriate paint. I decided on Golden Fluid Acrylic thinned with a little bit of Acrylic Flow Release. I knew I would use my Windsor & Newton Sceptre Gold brushes, but it took me some experimentation to settle on the 1/4" one. I knew I was taking on a challenge as most of the lettering I have done lately has been done with brush pens or markers and scanned into the computer where I can make adjustments in photoshop. I also knew that the setting required a more formal look than my recent work and that I would have to make guidelines. I can blithely commit to all kinds of things that require work and thinking beyond the art process because I know my husband Charlie will take care of the logistics. We knew we would need a level as the walls in the old house were not straight. We ended up using a 4' level. It took two of us holding it, Charlie with a flashlight to see the bubble clearly and me with a pencil for making the lines. 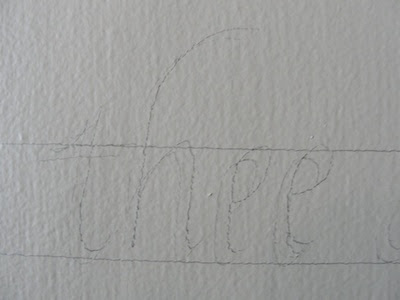 I tested making pencil marks on our wall and they erased easily. 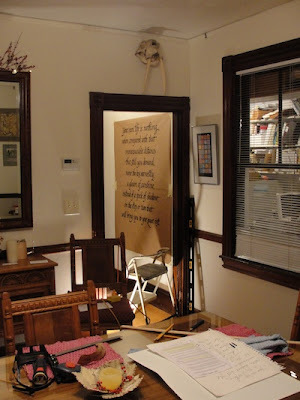 I couldn't do my practicing on the walls of our house so I used rolls of brown kraft paper taped to the wall. My big studio wall had been taken over by my new giant get-organized white board so the only available space was in the house at the base of the stairs. After some experimentation I decided that a centered layout was best. I knew I wasn't confident enough to write directly on the wall with paint so I planned to write first with two pencils held together with an elastic and use them as a guide when I used brush and paint. Writing the letters first in pencil enabled me to know the line lengths. After writing a few of the quotes out completely, I started writing one line on top of the next so we didn't have to make as many lines in the practice phase. We then ruled out each brown paper piece and I did the letters first in pencil and then with brush and paint. After I left out a word in the practice version of one of the quotes, we came up with a strict policy of multiple proofreads of the pencil version. Here's a picture Charlie took of me reenacting my discovery of the missing word. I'm not sure you can tell what word I was saying but it wasn't a nice one. 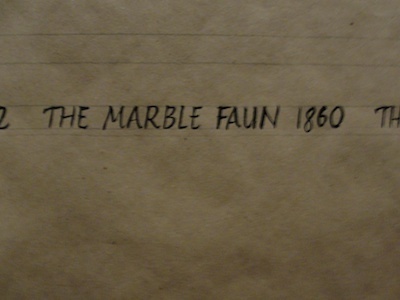 The following day we loaded the car and began our trip to Hawthorne's House. 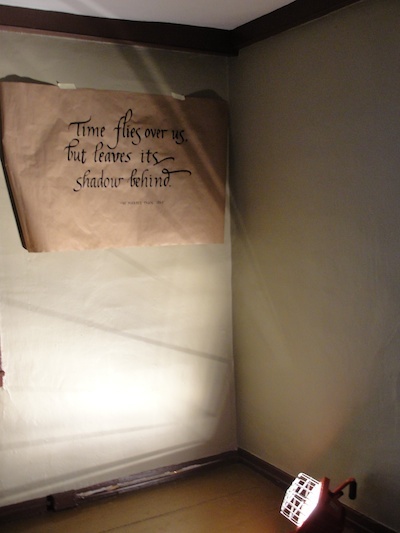 When we arrived, we met with Alan and used our brown paper versions to decide on the placement. We had planned ahead to do the work in phases and it worked beautifully. 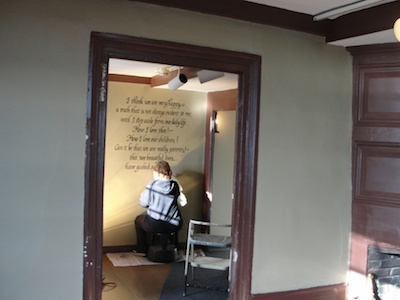 First we went through each room and put the lines on the walls. We had a center vertical line and two lines 1 3/4" apart for the letters with 3" in between. Then we went through and I wrote the quotes on the walls with my two-part pencil. After a short walk, some water and some seltzer, some deep breaths, and tuning in Mozart on my iphone, I started on the lettering with paint. I was surprised at how calm I was. 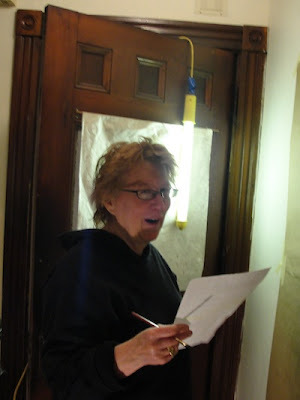 I felt peaceful as I worked with Charlie's lights counteracting the fading light of the day. In the last room, I kept thinking Charlie was behind me but it was in fact an image of Nathaniel Hawthorne himself keeping me company. With two things left to do, lettering on the attributions (already lined and sketched in) and erasing the lines, we left for the evening. We returned the following day and started by erasing the lines. The pencil that seemed to come off so easily on the wall at home took a lot of elbow grease to remove here. After both of us working for four and a half hours, we finally finished the task. A different soundtrack was in order and we chose the Beatles. The last step was to add the attributions. 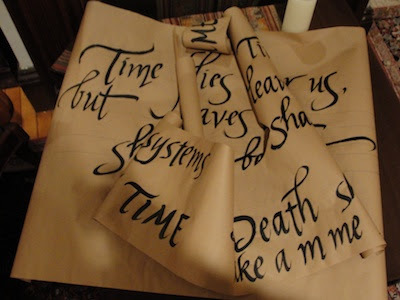 I had written them on brown paper and tried them in different places. I think this is one of the hardest parts. That last bit of information—the source of the quote— is often not part of the overall design process and it is so easy to place it poorly and throw the whole thing off at the end. I made them quite small and placed them six inches below the last line and to the right and was pleased with the arrangement. It was a gratifying project to do. 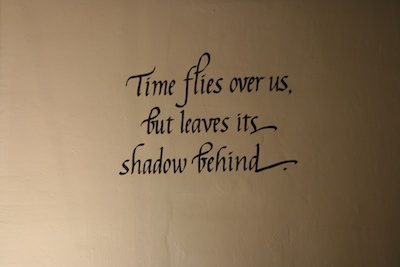 I love the way it put me back in touch with calligraphy and gave me a chance to write on a wall. And it taught me something about myself. My experience in teaching large groups, giving talks, doing installations, and generally throwing myself into unknown territory on a fairly frequent basis has made me a much more flexible and confident person than I used to be. 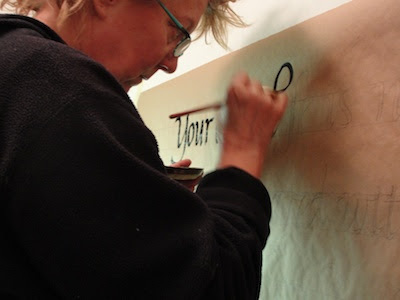 While I was much more practiced in the art of calligraphy twenty-five years ago, I would have been a quivering bundle of nerves. Thanks to Alan and Vicki for this opportunity to grow. Beautiful work, Susan! And thanks for sharing how you approached it. Wow, Susan! i get all weak in the knees with a paper calligraphy commission. It's great to see your thoughtful planning and gorgeous execution. susan these look awesome and its amazing to think of the work your husband and you put into doing it. But to see those words on the wall they look amazing.. Have you seen sandra mullers blog the art of confusion http://theartofconfusion.blogspot.com/search?q=calligraphy+on+the+wall. She also does calligraphy on the wall. I just love the overall effect. Maybe I can find someone in my home city to do it for me lol. 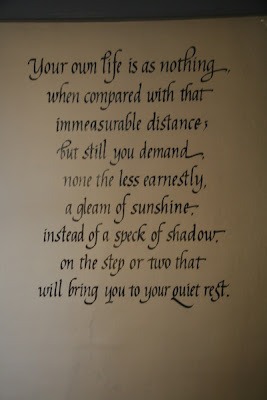 Now I want to paint quotes on my walls. Thank you for the detail, the photos, the text. It's beautiful. Susan, it was great to see your design and planning process. Tahnks for sharing it! Beautiful results too! Susan, I love how you detail your process. 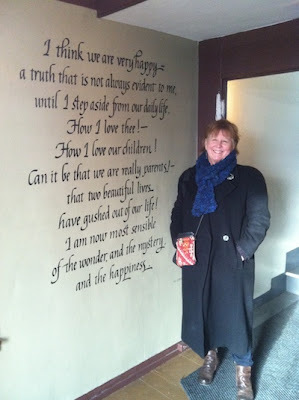 How wonderful Charlie is, and hooray to Vicky Hendrickson to know it should be you to create the beautiful walls. Brilliant selection of Hawthorn's words. Congratulations. Charlie for being your loyal and helpful handyman. What a pair! Susan, this is a marvelous post about this commission. What an honor to do this, and what a joy for you to be able to "just do it" for the joy of it, and not be that perhaps more polished but insecure younger self. A lovely insight into your journey. Thank you for sharing it. Thanks all for the comments. cg—I've been thinking about a spring trip to the Old Manse in Concord and the window. Am reading Brenda Wineapple's bio of Hawthorne. Lisa—thanks for letting me know about Sandra Muller's blog. 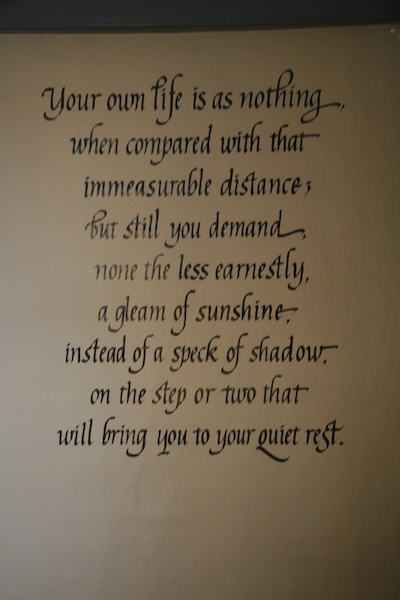 And good luck to all who are inspired to write on their walls. 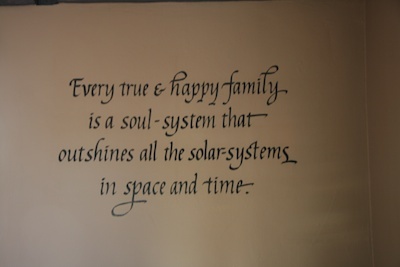 I'm thinking about a short quote above on of our bay windows but it's hard to choose a quote. So much easier to work with given words in another place.